The Rogue One Prequel series at Disney+ doesn't have an official title yet. But it is confirmed to be moving forward as the second live-action Star Wars TV show after The Mandalorian. It was previously confirmed that Diego Luna would be reprising his role as Cassian Andor. Now it has been announced that another very important Star Wars character introduced in Rogue One will also be back. 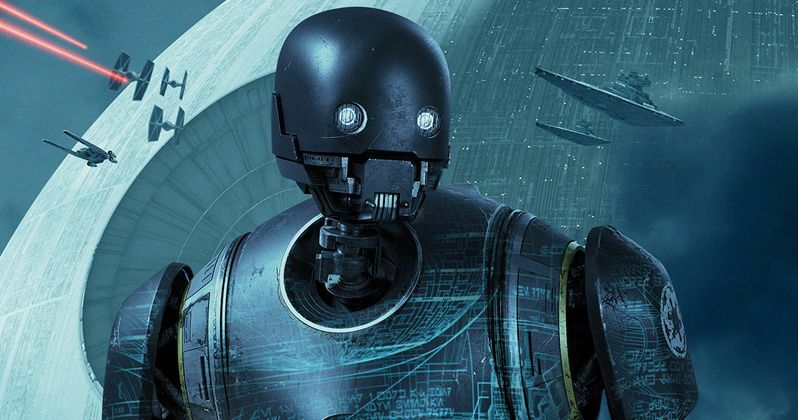 Yes, it was announced Thursday at the big Disney Investor Event that Alan Tudyk will return to reprise his role as former Imperial droid K-2SO in the Rogue One hour long sci-fi adventure drama. The news was made by Lucasfilm boss herself Kathleen Kennedy. Stephen Schiff will be serving as showrunner on the upcoming streaming series. No further details are being revealed at this time. K-2S0 is a former member of the Imperial Army who has joined the Rebellion. He was very deadpan, used to inject more humor into later cuts of Rogue One, and he became one of the breakout new characters in the Disney era of the franchise. The Rogue One prequel doesn't have a set release date, but it will likely arrive sometime in 2020. The Mandalorian will officially premiere on Disney+ on the date of launch, November 12. The Jon Favreau led show recently finished shooting its first 10 episodes. Kennedy said the series looks amazing, and fans will get their first taste of the action this Sunday, when Lucasfilm brings the show to Star Wars Celebration. Also part of today's announcement was a new season for Clone Wars, which was announced earlier at last year's Comic-Con. It was reported by Deadline that Disney showed off a short sizzle reel for The Mandalorian. It opened with the lone gunman on an icy landscape. The footage then cut to Jon Favreau backstage with his team behind the live-action Star Wars adventure. Pedro Pascal had this to say about the bounty hunter. "He's relatable, we're all covered in our own armor." Not much of the story was revealed, but the Star Wars iconography was quite apparent in the visuals that were shown off. More from the series will be seen in Chicago during Star Wars Celebration this weekend.